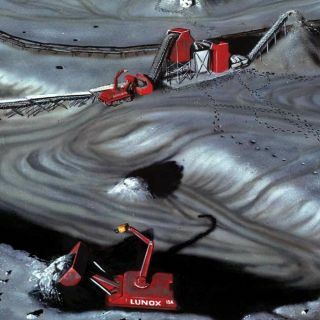 An artist's interpretation of autonomous robots digging through regolith on the Moon's surface. Six teamsfrom across the country are headed for a rumble in California on Saturday,where $250,000 in NASA prize money awaits the best robotic Moon dirt diggers. Thecontest, NASA's2007 Regolith Excavation Challenge, will pit the autonomous robots againstone another to determine which can move the most mock lunar dirt - or regolith- in 30 minutes at the Santa Maria Fairpark in Santa Maria, California. "We've gota great group of teams," said Matt Everingham, special projects manager for theCalifornia Space Authority, a co-host for the competition. "They have a varietyof configurations and a variety of construction styles...I can't wait to seethem operating." The contestis part of NASA's Centennial Challenges program, which offers cash prizes fortechnological feats in order to spur interest and development in spaceflighttechnology. Unlike NASA'sAstronaut Glove Challenge, which awarded one $200,000 prize on May 3 to unemployedMaine engineer Peter Homer after his homemade spacesuit glove beat out those ofto other teams, the Regolith Excavation Challenge is offering three top prizes totaling$250,000. They are split into $125,000, $75,000 and $50,000 prizes respectivelyfor first, second and third place. The CaliforniaSpace Education and Workforce Institute (CSEWI) is overseeing the contest forNASA. About 130students ranging between Kindergarten and Grade 12 will also compete onSaturday during the California RoboChallenge. The contestcalls for students to construct their own robots out of Legos to either followlines or compete in sumo wrestling-like feats, organizers said. Like theRegolith Excavation Challenge, the competition is aimed at spurring interest inscience and technology. "We need tohave something to excite their interest again," Deborah Hirsh, executivedirector of CSEWI, said in an interview. To win thecash prizes for NASA's Regolith Challenge, teams must demonstrate fullyautonomous robots capable of collecting at least 330 pounds (150 kilograms) ofmock Moon dirt within 30 minutes. Whichever robot moves the most regolith overthe benchmark limit, while still meeting contest specifications, wins, NASAsaid. But inorder to compete, lunar regolith excavators must weigh less than 88 pounds (40kilograms) and run on less than 30 kilowatts of power, according to contestrules. For oneteam, the Lunar Miners at the University of Missouri-Rolla in Rolla, Missouri,the solution turned out to be a two-conveyor belt number. "One has anumber of scoops on it to excavate regolith...the other delivers the excavatedregolith to a collector," said the team's co-leader Joel Logue, a seniorstudying engineering, in a statement. "Excavation by a conveyor was found mostenergy effective after evaluating several other possible designs." Everinghamsaid teams will have about 10 minutes to set up their machines at a sandboxfilled with JSC-1a, a simulated Moon dirt developed for NASA's Johnson SpaceCenter. Once in place, the machines will be switched on and left to run by undisturbedfor a half hour. "They haveto be fully autonomous," he said. "That's an important detail." NASA has morethan a passing interest in developing machines to push Moon dirt around, KenDavidian, Centennial Challenges program manager, told SPACE.com. The spaceagency plans to set up a base camp on the Moon'ssurface by 2020, where lunar regolith may be piled over or against theexterior of astronaut habitats to serve as a radiation shield, Davidian said.NASA also hopes to extract oxygen and other minerals from the untapped lunarregolith. "But basically,before you can extract it, you've got to excavate this stuff," Davidian said. Davidian addedthat NASA experts from the agency's Kennedy Space Center in Florida, GlennResearch Center in Ohio, and the Jet Propulsion Laboratory in Pasadena,California will be on hand for Saturday's competition. "They'll belooking at the technologies that are going to be competing," he said. Saturday'sMoon dirt digging contest will mark NASA's fifth Centennial Challenge to reachthe competition level. In additionto last week's Astronaut Glove Challenge, the space agency's Northrop GrummanLunar Lander competition met in October 2006, but yielded no winner. The agency'sBeam Power andTether challenges, which have each been held annually since 2005, have alsonot ended with cash-winning victors. Anyunclaimed prize money from Saturday's competition will be rolled over to theevent's planned 2008 contest to add to a planned $500,000 purse, NASA said. "We'reexpecting some fairly high level competition," Davidian said of Saturday'sregolith-moving showdown. "It will be nice if there's another winner."